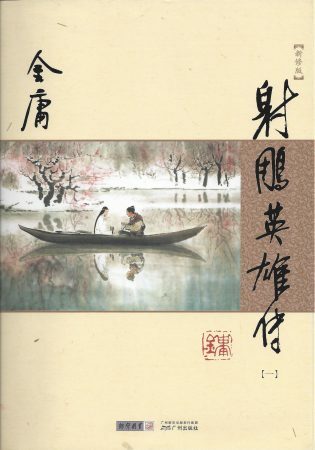 When I agreed to write a book review of the first-ever English translation of Legends of the Condor Heroes, I had no idea I would be opening Pandora’s box of not only nostalgia, but also questions about translation and language. 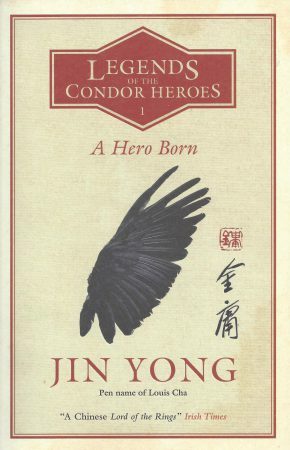 Condor Heroes is a massive 12-volume trilogy written in Chinese by the late Dr. Louis Cha, under the pen name Jin Yong (金庸). First published in 1959, the original volumes didn’t have individual titles; they were merely numbered 1-12. Before that, the stories were originally published in his newspaper, Ming Pao, as a continuing fiction series—but that is a history lesson for another day. 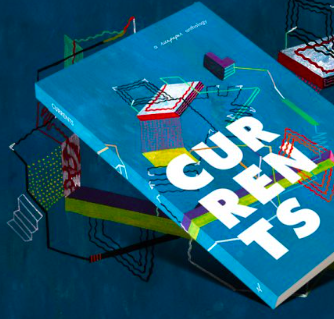 The first volume has since been translated into English by Anna Holmwood and named A Hero Born. The added bonus of giving the translation an entirely new title is that it is easier to distinguish it as the English-language version. Published in February 2018, Holmwood’s translation has been such a huge success that MacLehose Press plans to translate one volume each year, until the entire set is completed. Gigi Chang is translating Volume Two, with the title, A Bond Undone. At the writing of this article, Amazon lists that the title will be available for purchase in late January 2019. Holmwood is editing that one, while translating Volume Three for its proposed February 2020 publication. For example, in A Hero Born, Lotus Huang and Guo Jing sneak into the Jin palace. Lotus injures a servant in order to coerce him into helping them get medicine from the royal pharmacy. I did a double-take. Did Dr. Cha really mention a detail so funny, about the character having snot? And did that snot really bubble from the servant’s nose? This called for a closer look. Adding to the confusion, the Condor Heroes trilogy exists in three different editions: 1959, 1976, and 2003. Each edition features significant revisions by Dr. Cha himself, including characters being edited out entirely, when he later decided them to be superfluous. The 2003 edition in particular was not necessarily well-received by all fans; some still prefer the earlier versions. Moreover, Condor Heroes was banned in Taiwan until 1979, so underground versions were produced that barely resembled the originals. 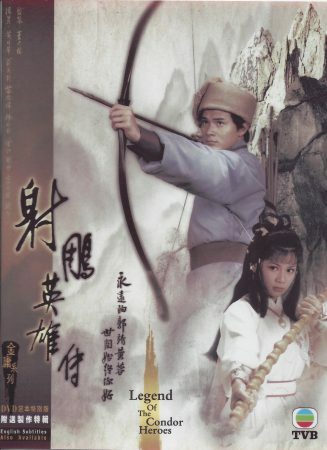 With three different versions of the “original” Condor Heroes, unauthorized versions floating around Taiwan, as well as numerous TV and film adaptations—is there even an “original” Condor Heroes anymore to begin with? Stember also pointed out that the differences between Chinese and English make translation between the two languages especially difficult. By taking on such an ambitious project, of such a famous Chinese literary work, Anna Holmwood is surely setting herself up to be a lightning rod for criticism. What would compel her to take on such a crazy task? “The folly of youth,” she says with a laugh. Anna Holmwood answers my Skype call from her home in Malmö, Sweden. We spoke twice last year, in August and in September. Even more so when the figure is Jin Yong and his legions of fans. Holmwood, who has a master’s degree in modern Chinese studies from Oxford University, began working as a professional translator in 2010. Two years into her career, she noticed that Legend of the Condor Heroes hadn’t been translated in English before. With the debut of A Hero Born in February 2018, she is the first person in 59 years to begin doing so. “I thought it would be career-defining,” says Holmwood. She was right. Success of A Hero Born has “far exceeded expectations.” St. Martin’s Press has purchased the US rights for the first four volumes and will begin publishing a US version of A Hero Born in 2019. Given that the 2003 edition is a bit controversial among fans, I asked Holmwood why she chose that one. Her reason was simple: That was the edition requested by Dr. Cha’s representatives. Who can argue with that? Holmwood completed the bulk of translating the 120,000 words of A Hero Born in 18 months, but in total, it took five years of behind-the-scenes work to bring it to publication. And yes, there were times when she had doubts and worries about potential criticisms from Condor fans. The most hotly-debated topic online is Holmwood’s choices in translating names. Some allege her of being inconsistent. Until Stember educated me on how to assess a translation, I also noticed the differences and questioned why Holmwood appeared to be inconsistent. Some names were kept in their original pinyin, in Chinese order, with surname first (“Guo Jing”). Others were translated directly into English, with surname at the end (“Ironheart Yang”), while some were translated into a subsense (“Apothecary Huang”). And still others were changed entirely from their original Chinese (“Kholjin”, “Gallant Ouyang” and “Mercy Mu”). For the character Huang Rong (黃蓉), I looked up “蓉” (“Rong”) in the Oxford Chinese Dictionary. “‘Rong’ doesn’t translate into ‘Lotus,’” I say. “Why did you change Huazheng (華箏) into Kholjin?” I ask. Kholjin is an entirely different name! Holmwood explains that she researched Mongolian names and had found that Genghis Khan did have a daughter named Kholjin. She thought it would be more authentic to use an actual Mongolian name in the translation. For the record, Holmwood does give detailed responses on why she made the name choices she did. However, given the limits of our interview time, I felt that I couldn’t do it justice, so I’ve abbreviated her actual response in this article. The other point that arises from our discussion is the fact that there is a dearth of Chinese-English dictionaries, compared to translation dictionaries of other languages. Ditto for the names of Genghis Khan’s daughters. Prior to our interview, I did attempt to research local resources, but couldn’t find any. My next step would have been to seek a university library and higher levels of help. But until then, Holmwood’s is the only one. Chinese only has “鼻涕” (bítì) for nose mucous and is neutral. Using Stember’s tip as a guide, Holmwood did a great job. She did alter the translation, yes—but for the better, and she did it without altering the character of Dr. Cha’s text. Kind of like taking someone whose face is already beautiful and applying makeup skillfully on it. I did some more spot checks. The original draft of this article featured more examples, but it began to read too much like an academic dissertation. What I learned from this journey is that a good translation isn’t necessarily about a word-for-word, dictionary-like approach. That could get tedious, especially if the two languages have very different structures, such as Chinese and English . 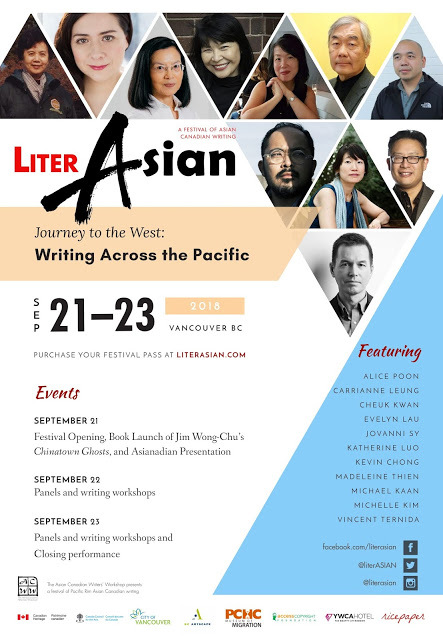 What’s important is whether Holmwood can capture Dr. Cha’s talents as a writer: the unique personalities he forged in his characters, his wisdom of human psychology, and his sense of humour. I would say she did. And it looks like I’m not the only one who thinks so. Most touching for Holmwood is when people of American-Chinese heritage let her know how happy they are that because of her, they can now read and enjoy the full text of Condor Heroes in English.